FERRY FARM’S SHARE OFFER REACHES TARGET ! Congratulations to Ferry Farm. An amazing £325,000 has been raised by 93 investors. 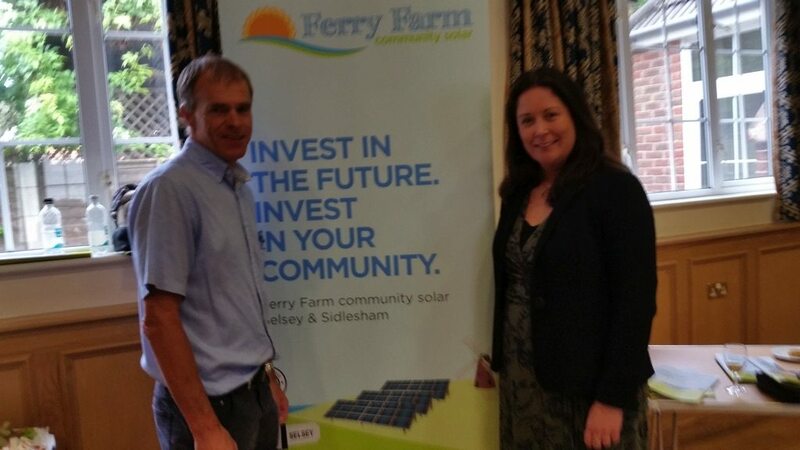 This will help fund and manage a 5MW community-owned solar farm at Ferry Farm, nr Selsey, West Sussex. Work is underway on the site for a new 5MW solar farm at Selsey in a community-owned project that will provide clean energy sufficient to power 1,300 homes. The innovative scheme at Ferry Farm is expected to be generating low-cost, low-carbon electricity by the end of June by “harvesting the sun.” Ferry Farm Community Solar will also provide an estimated £1 million in income to the community for the next 20 years. The money will be used to combat fuel poverty, support energy efficiency and fund local organisations. The project will also benefit local wildlife. The solar farm is sited on land owned by the Langmead Group, which farms 4,800 acres in West Sussex and is a leading producer of fresh herbs and salad crops for UK supermarkets. Langmead chose the Ferry Farm site west of the Chichester Road leading into Selsey because the Manhood Peninsula has one of the best sunshine records in the UK. In just two years Langmead has become the largest provider in West Sussex to pioneer solar energy on this scale and in this timeframe. High light levels close to the sea make its land ideal for solar power generation and it consistently beats targets at its three existing solar farms in the area. The Ferry Farm project will be owned and run by a Community Interest Company (CIC), and a Community Benefit Society has been set up to distribute any profits from the project to local community groups. Langmead approached Selsey Town Council, Sidlesham Parish Council and residents of Upper Norton and Ham for their views as part of the planning process and incorporated their feedback. The scheme has been designed to minimise the impact on the landscape and character of the area and maximise the ecological benefits. Some 1,250m of new trees and hedgerow are being planted to screen the site from roads and footpaths, with the solar panels positioned to reflect minimal glare. Once construction is complete the site will be very low maintenance with no disruption to residents. In 25 years the solar panels can be dismantled and the fields returned to farmland. Ferry Farm Community Solar is the first such community scheme from the Langmead Group, which farms 6,200 acres in West Sussex, Scotland, Suffolk and Spain and has diversified into renewable energy to increase its commitment to sustainability and strengthen its business. The site is located on lower quality, less efficient farmland and close to sewage works, making productive use of unappealing land and improving the efficiency of Langmead’s farming business, which employs 200 people in West Sussex. In partnership with solar-energy specialist BNRG Renewables Langmead has developed 35MW of solar panels in the county since 2014, enough to power around 11,000 homes for a year. These are installed on arable fields in Bilsham and Shripney near Bognor Regis, Lagness near Chichester and in North Wales. Ferry Farm will take the total to 40MW across 233 acres, of which 15MW will have been connected in 2016 alone. That is enough to satisfy the electricity needs of around 12,500 typical British households, displacing around 17,000 tonnes of CO2 in the process. Work is being carried out to create habitats for native species. Open spaces between the panels will be seeded with grass and wild flowers to attract wildlife. Langmead is also working with the RSPB, Europe’s largest nature conservation charity. A wildlife report from experts Loughborough Ecologists submitted to planners found that: “The overall impact of the proposal is considered to be positive and beneficial for wildlife.” Species to benefit include bats, badger, hazel dormouse, small mammals, birds, reptiles, amphibians and invertebrates. David Langmead, Landowner and Rebecca Kelly of BNRG at the launch event.